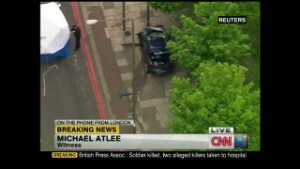 London (CNN) -- They first hit the man, thought to be a British soldier, with a car in broad daylight. Then the two attackers hacked him to death and dumped his body in the middle of a southeastern London road. As the victim -- dressed in what appeared to be a T-shirt for Help for Heroes, a charity that helps military veterans -- lay prone, one of the two attackers found a camera. "We swear by almighty Allah we will never stop fighting you until you leave us alone," said a meat-cleaver-wielding man with bloody hands, speaking in what seems to be a London accent. "The only reasons we killed this man ... is because Muslims are dying daily," he added, in video aired by CNN affiliate ITN. "This British soldier is an eye for an eye, a tooth for tooth." One witness, Michael Atlee, described the gruesome, frenzied and ultimately fatal sequence of events Wednesday afternoon as "a bloody mess." Could London killing inspire other attacks? British Prime David Cameron called it a terrorist attack. "We will never buckle to terror," Cameron wrote on Twitter. Home Secretary Theresa May offered a similar assessment Wednesday night of the situation and a similar message of resolve. "We have seen terrorism on the streets of Britain before, and we have always stood against it," she said. "Despicable acts like this will not go unpunished." 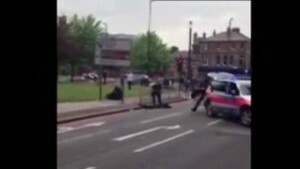 A witness, who identified himself only as James, told London's LBC 97.3 radio station that he saw two men standing by the victim, who was on the ground in the British capital's Woolwich neighborhood. At first James thought they were trying to help the man. But then he saw two meat cleavers, like a butcher would have. "They were hacking at this poor guy, literally," he told the radio station, as if they were trying to remove his organs. "These two guys were crazed. They were just not there. They were just animals." Afterward, the men appeared to want to be filmed, with one of the attackers going over to a bus and asking people to take photos of him as if he wanted to be on TV. A man who asked not to be identified told ITN that he was on his way to a job interview when he came up on the scene and started filming it. Then, a man with a cleaver and knife in his bloody hands "came straight to me (and) said, 'No, no, no, it's cool. I just want to talk to you.'" The suspect went to apologize to women who had witnessed the attack, then quickly added "but in our lands our women have to see the same." "You people will never be safe," he said. "Remove your government. They don't care about you. You think David Cameron is going to get caught in the street when we start busting our guns? "... Get rid of them. Tell them to bring our troops back so we can all live in peace." The first call about an assault came in at 2:20 p.m. (9:20 a.m. ET). At some point afterward, police responded, including armed members of a firearms unit, even though British police typically don't carry guns. Metropolitan Police Commander Simon Letchworth noted that "early reports" indicated the attackers had "weapons." Metropolitan Police say they're aware of reports it took 30 minutes for police to arrive. The suspects rushed at the arriving officers before being shot, James told the radio station. The Independent Police Complaints Commission said the Metropolitan Police informed them at 2:50 p.m. of "an incident," as would happen when police shoot and injure someone. Letchworth said both suspects were taken to separate London hospitals for treatment. Metropolitan Police Commissioner Bernard Hogan-Howe later said the two had been arrested, though it wasn't immediately clear if this happened at the hospitals or elsewhere. "We understand concern about the motivation, and we will work tirelessly to uncover why this occurred and and who was responsible," Hogan-Howe said, adding that his force's counterterrorism unit will lead the investigation. "I understand people want answers, but I must stress we are in the early stages of investigations." Cameron -- who was in France at the time of the incident but headed back home promptly -- declined to confirm if the man killed was a serving soldier, while Britain's Defense Ministry said it was investigating to see whether that's the case. Yet Nick Raynsford, a member of Parliament, told CNN that the victim is believed to be a serving soldier who was based at a nearby barracks. The soldier had apparently been on duty in central London and was returning to the Royal Artillery Barracks in Woolwich when he was attacked, Raynsford said. The MP described Woolwich as a mixed, multicultural area, adding that troops stationed at the centuries-old military barracks there have a close relationship with locals. Even as they worked to piece together what happened and why, British authorities beefed up security around Woolwich and all military barracks in London, according to a British government source. And British Defense Secretary Philip Hammond said the killing was a "very shocking incident" and that the United Kingdom takes the safety of its troops "very seriously," as he headed into Wednesday night to a meeting of the country's civil emergency committee known as COBRA. The incident raised concerns it may inflame animosity against Muslims, with Metropolitan Police deploying riot police as a precautionary measure. The Muslim Council of Britain, after condemning what it called "a truly barbaric act that has no basis in Islam," urged Muslims and non-Muslims alike "to come together in solidarity to ensure the forces of hatred do not prevail." Later Wednesday, a man with two knives threw a smoke grenade into a mosque in Essex, a county east of London, and demanded someone come outside to answer to the Woolwich slaying, the mosque's secretary said. The only person inside called police who came quickly and arrested the man, said Al Falah Braintree Islamic Center secretary Sikander Sleemy. "I believe this was a revenge attack for what happened in Woolwich," Sleemy said. "We strongly condemn what happened in Woolwich. It's not an Islamic act." That attack had already spurred swift condemnations around the world and especially in Britain -- from a "concerned" Queen Elizabeth II, to London Mayor Boris Johnson's description of a "sickening and unforgivable act of violence," to Labour Party leader Ed Miliband's prediction that the "whole country will be horrified." That's certainly true for Lauren Collins, who saw the gore up close. "I still am quite shaken at what I've seen," she told CNN. "I've seen a victim of an awful attack, and I've seen a body of a young man." 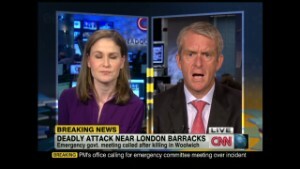 CNN's Laura Smith-Spark reported and wrote from London, and CNN's Greg Botelho wrote from Atlanta. CNN's Mariano Castillo, Joshua Levs, Atika Shubert, Stephanie Halasz, Kim Chakanetsa and Pierre Meilhan contributed to this report.